The Sueno Hotel and Golf Club is one of Belek’s newer and more ambitious facilities. Located a few hundred metres from the sea and boasting its own private beach, 174-bedroomed 5-star hotel and two 18-hole golf courses, Sueno is a prize Turkish delight. Bob Hunt, of Bristol based company, International Golf Design – formerly known as PGA Design Consulting – created both courses at Sueno Golf Club and they opened for play in October 2007. The Dunes is the shorter par 69 resort course, which measures a modest 5,643 metres from the back tees. It’s a decent resort course in its own right, but it’s the 6,413-metre championship Pines course that heads Sueno’s golfing bill. Routed over a generous 400-acre site, both courses flow through the umbrella pines and over the rolling sandy terrain of Belek. The Pines course naturally features plenty of pine trees, but strategic bunkering (in conventional and blow-out style) and a healthy splash of water hazards are well and truly in the mix. The opening hole is a par five appropriately named “The Big Easy” as its wide fairway allows golfers to get into their stride. The short par four 2nd is the first water hole called “Up and Over” requiring careful club selection from the tee to get as close as possible to the lakes in order to leave the shortest approach to a wickedly contoured green. “Little Gem”, the 3rd, is a short but pretty par three and it requires a precise tee shot over a lake to a peninsula green. Don’t go too far left as the green cants left towards the lake that will gladly gobble your balata. 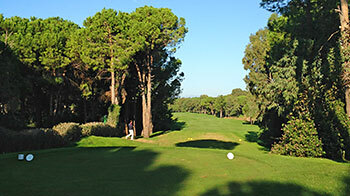 Numerous solid golf holes follow on from here and there’s even a hint of Pine Valley at the short par four 12th which is set among the ancient pines where waste bunkers flank the right side of the fairway. The 13th, “Rugged Valley” is a cracking longish par three cut through a valley to a tricky tabletop green that’s ringed with pines. The home hole is a clever mid-length par four that presents a visual illusion from the tee. Called “Mirage”, the drive seems impossibly tight to this dogleg right where two bunkers are cut into the elbow with a lake behind. There’s actually more room than you imagine but it plays an optical game with a golfer’s mind. The Pines course at Sueno Golf Club is an excellent addition to Turkey’s burgeoning portfolio of top-notch golf courses and it has elevated the Belek region to a new level. Played Pines last week, and it didn’t go well. We had booked 2 buggies for our four ball, because of the expected 35deg heat, but on arrrival were told they did not have any. There were lots of golfers getting very upset at being told they had to pull carts, as there were no electric carts either. Arrived at the first tee, only to be told the starter had a later time than we had, and was running late, which meant we tee’d off 25 minutes late. Even worse, there was a solo golfer in front of us who sprayed at least 3 balls around every hole. Then we played the round of golf which took 5 minutes short of 6 hours, with not a Marshall in site. The course was actually very good, and well maintained, but frankly, when you wait on every tee for 10 minutes, you lose interest! If you are going to book, do so with your eyes open. I’m afraid I won’t play this course again. After playing The Montgomerie Maxx Royal in the Turkish Airlines ProAm and night golf at Carya, I was excited to tee it up at Sueno Pines and see how the course compared. I have never seen a putting green like it in my life, similar to Carya, about 100 yard long and some of the largest slopes I have ever seen. The 1st hole was a fantastic but extremely tough Par 5, setting the tone for a next extremely tight treelined classic with well positioned bunkers/water hazards and undulating fairways. The condition of the course was very good, greens running at a good pace and very receptive. As a whole the layout was fantastic, but the only downside was having to come off after 15 because of how slow play was. Waiting 15 minutes over every shot in that heat becomes too much, and with seemingly no one having any etiquette to let you thru it became too much. 4 1/2 hours for 15 holes was a bit silly and all caused by the sheer amount and traffic on the course. A real shame to what was a very good layout. This is a very good golf course. Lykia Links and The Sultan are better, and the Cornellia on better land (but much tougher). This is a notch below those courses, but on par with everything else in the area. It is very enjoyable, and easier to score on than most. If you are planning to play 4 or 5 different courses on your trip, this should be one you pick. The golfing scene in Belek has to be seen as a success story; there are now plenty of courses to choose from and the Pines at the Sueno resort is towards the top end. The whole resort oozes class and the course that opened in 2007 is already delightful and a joy to play. If you are not staying at the Sueno my advice is to get there early and enjoy the off-course facilities ahead of your golf that include an impressive range and a monster-sized putting green. The view from the clubhouse terrace gives an in-sight as what to expect of the course – both the 9th and 18th greens are in view and the obvious water hazards at both greens are scary to look at, let alone play. These pine-lined fairways have a similar look to some of the other local courses but the design of the holes have more detail than most. The front nine develops well and is very strong from the 5th which is a clever dog-leg to the left with a fairway sloping to the right. The 7th is a picturesque over water par-3 and then the 8th which I think could split opinions; it is a double dog-leg par-5 with a tall pine in the middle of the fairway about half way between the tee and the green – for the record, I think it is great hole (even though I lost a match on this hole). The 12th and 13th (par-4 and par-3) are great back to back holes and just like the end of the front nine, the last hole with water in play brings obvious drama; my only observation is that swapping the 9th and 18th holes around could be a good move as I think the 9th is just a little stronger and with the green directly in front of the hotel, it just feels more of a finishing hole than the current 18th. Great to see the course debut into the European rankings too – well deserved.